Southwest Airlines flight 1380 from New York to Dallas had to make an emergency landing in Philadelphia today. One of the plane’s engines reportedly exploded, breaking a window and causing a woman to nearly be sucked out. One person has been confirmed dead, and passengers are sharing photos and videos from the incident—including ones taken from the air. One father-in-law of a passenger told Philadelphia’s local NBC affiliate that a female passenger was being sucked out of the broken window before being thankfully “pulled back in by other passengers.” That passenger was reportedly rushed to the hospital upon landing. One Twitter user, Joe Marcus, posted a photo of the blown out engine, which has since gone viral on social media. But it was the attempt by one passenger to livestream the aftermath that gave us one of the most horrifying pictures of today’s emergency landing. Engine exploded (we think) and shattered one of the windows killing a passenger. 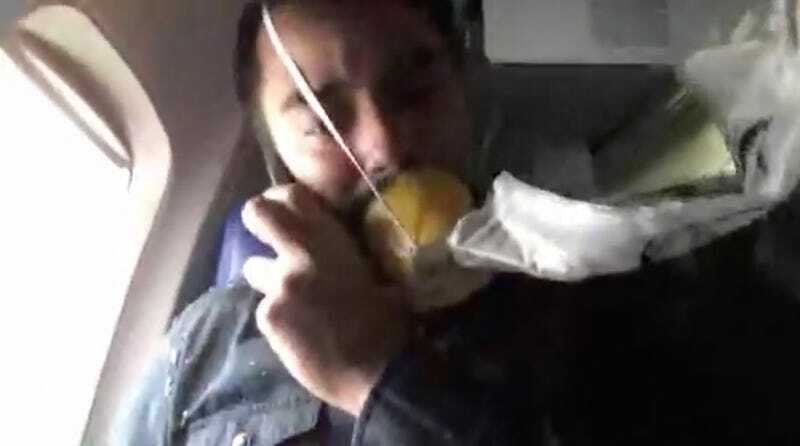 Flight attendants ran over calling for passengers to help cover the hole as they broke down and began uncontrollably crying and looking horrified as they looked outside. Plane dropped dramatically and it smelled like fire with ash coming down on everyone thru the vents. Absolutely terrifying, but we are okay. It has been confirmed that one person died, but Martinez could not be immediately reached for comment. Martinez posted both photos and video after landing, which showed the harrowing moments when passengers thought they might crash. The National Transportation Safety Board tweeted that the organization is still investigating the incident and hasn’t released any further information. We’ll update this post as we learn more. Update, 1:37pm: The NTSB has announced that it’s sending a team to Philadelphia to investigate. The agency also said via tweet that Chairman Robert Sumwalt will be holding a briefing about the incident at 3pm Eastern time. Update, 2:38pm: Philadelphia Fire Commissioner Adam Thiel has announced that one passenger was critically injured and seven others were treated for minor injuries. The passenger in critical condition was transported to the hospital. The passenger who died was Jennifer Riordan, a 41-year-old Wells Fargo bank executive from Albuquerque, New Mexico. She was the one who was nearly sucked out of the plane. She leaves behind a husband and two children. The pilot of the plane, Tammie Jo Shults, is being hailed a hero for landing the plane safety after disaster in the air. Shults was one of the first women pilots in the US Navy. NTSB Chairman Sumwalt says that metal fatigue in the titanium fan blades is most likely what caused the engine to explode. This was Southwest Airline’s first death, and the first on a US airline in nine years. Correction: The local NBC TV affiliate that first reported a woman was almost sucked out of the plane cited its source as the father of a passenger. The NBC station has since changed its story to say that it was the father-in-law of a passenger. Gizmodo has changed the language above to reflect that. This story also said that the emergency landing took place in Dallas. Gizmodo regrets the error.